The 4th Global forum on Human Resources for Health is an event that takes place every four years and brings together stakeholders from around the world to discuss the global Human Resources for Health (HRH) agenda with the aim of attaining universal health coverage, health security and achieving Sustainable Development Goals (SDGs). This year’s event was held from 13th to 17th November 2017, at the Royal Dublin Society in Ireland. The forum was premised on the theme: “Health Systems for the Future: 2030 and Beyond.” The event brought together more than 1000 delegates from over 90 countries from across sectors and institutions including representatives of: governments, UN Family, academia, civil society and youth and discussed all aspects of HRH. 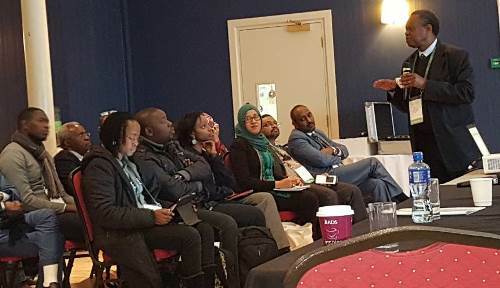 The African Centre for Global Health and Social Transformation (ACHEST) was represented by a high level delegation of seven people who included; Francis Omaswa, Peter Eriki, Patrick Kadama, Elsie Kiguli-Malwadde, Vincent Ojoome, Robert Odedo and Loice Epetiru. Their participation was supported by the WHO except for one delegate who was sponsored by the HSA Partnership project. 7. How Quality Improvement Empowers Health Workers to Improve Performance–Moderator Francis Omaswa, Speaker Vincent Ojoome. Two Ministers from Uganda participated at the Forum namely: Hon Sarah Opendi Minister of State for Health General Duties and State Minister for Finance, Hon. Eng. Gabriel Ajedra Aridru. Hon Sarah Opendi participated at the Side Event on Brain Drain Brain Gain and Plenary 3 on; Policies and Planning for Labour Markets Transformation and Employment for Health. Hon Dr Gabriel Ajedra Aridru participated in Plenary 6 on the Investor’s Forum: Fiscal Policy and Financing for Jobs, Health and Economic Growth. Speaking at the conference he acknowledged that training of the healthcare staff in Uganda was not given priority by the political leaders. He noted that the need for training health care givers became so close to his heart at a time when his wife needed a specialized operation that could not be done in Uganda and after this experience he pledged to become a crusader for the health care agenda at the Ministry of Finance. Francis Omaswa, the Executive Director of ACHEST while speaking at the Closing Plenary stated that “The biggest thing that could come out of this Forum is that all the thousands of us who are here will go back home as individuals who care for those who need health workers and do not even know that they can do something about it. He cited the example of caring by the nurse from Australia who gave her own blood to her patient who needed blood. He applauded the message communicated by Agnes Soucat of WHO that the UN High Level Commission on Health Employment and Economic Growth has demonstrated that Investment in health workers has a positive impact on economic growth. Francis Omaswa noted that originally development partners like World Bank and IMF taught our leaders in Africa that health is a consumptive sector and a bottomless pit. He called for a big effort to reverse and “un-teach” this outdated message which partly explains why investment in health in Africa is not yet at the desired level. For instance in Uganda the health workers are on strike because there is no money to pay them which places an urgent need for Africans to unlearn the prior teaching that health is just consumptive. The African Platform on Human Resources for Health also held its Business meeting where a new Governing Board was elected. Professor Omaswa was retained as Board Chair and Professor Peter Ngatia of Amref University, Nairobi was elected as Vice Chair. The Business Plan for the platform were presented and adopted and the Board was asked to finalize the Constitution of the APHRH. In another Oral session on the role of Partnerships, Network Towards Unity for Health was underscored to have provided an opportunity for Elsie Kiguli-Mlwadde, the Deputy Secretary General who acknowledged the great role played by partnerships in mentoring young educationists. Elsie benefited from strong mentorship where after 15 years she is able to take a leadership mantle which would not have been possible without the South to South partnership initiatives. The Oral Presentation on “How Quality Improvement Empowers Health Workers to Improve Performance”, Vincent Ojoome made the presentation on the Uganda QI Program 1993- 2017 on behalf of Henry Mwebesa from MOH Uganda. Some participants rated this session as one of the most inspiring of the whole Forum. The Forum adopted the Dublin Declaration which was developed and agreed in advance of the proceedings of the Forum. Key issues in the Declaration are: Taking inspiration from the ambition of the 2030 Agenda for Sustainable Development with its vision to leave no one behind, Acknowledging the growing evidence from World Bank Group and the International Monetary Fund that investments in human capital leads to faster economic growth, taking into account the integrated nature of 2030 SDG Agenda to address long standing and growing health workforce challenges among others.